May 16, 2014: The “Modi wave” in the just-completed Indian elections was bigger than almost all the projections. Based on final results in almost all constituencies, Narendra Modi’s Bharatiya Janata Party (BJP) will have 282 seats, enough to form a single-party government if it chooses. The National Democratic Alliance, the BJP and its pre-election allies, will control 336 seats. This result dwarfs any winning majority in the past thirty years. The U.S. is optimistic about the outlook. Now more than ever, India-U.S. relations need high level attention. The BJP dominated northern, central, and western India. In south India, it returned 17 out of the 28 seats from Karnataka – the one southern state where it had briefly run the government – and won seats in Andhra Pradesh and Tamil Nadu, where it had previously had virtually no presence. Factoring in its allies, the NDA now has a strong showing virtually all over India. The outgoing Indian National Congress was devastated. Its 44 seats are by far its worst showing ever – including its disastrous defeat in 1977 after Mrs. Indira Gandhi’s two-year experiment with authoritarian government, the Emergency. The seat totals for India’s two largest regional parties are almost as large as for Congress: the All India Anna Dravida Munethra Kazagham (AIADMK) under Jayalalithaa in Tamil Nadu won 37, and Mamata Banerjee’s Trinamool Congress in West Bengal 34. India’s communist parties continued their decline, with only 10 seats in the incoming house. Decisive government. The numbers and Modi’s personality both point to a government eager to make decisions, and under strong public pressure to deliver quick results. The other side of that coin: not much consultation or preparatory schmoozing with opposition figures before decisions are pushed through. Focus on the economy. 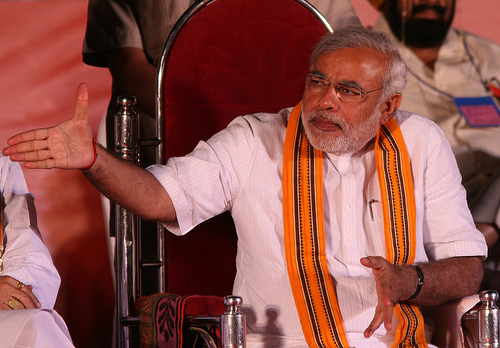 Modi’s Gujarat has prospered, and has encouraged investment. Modi has campaigned on this record. Expect strong emphasis on projects and implementation. More continuity than one might expect in areas where established programs are working. Long-standing subsidies and programs like the previous government’s employment and food security initiatives are likely to remain. Shifts in personnel among senior bureaucrats. India’s civil services famously go on forever, but it is common to see some of their top members move within a few months after an election. After a sea change like this, there may be more movement than usual. This suggests that relations with major economic partners will be important – but tells us little about how they will be conducted. Relations with Pakistan will be vulnerable to disruption by spoilers. The new government will want to show strength if India is hit by bombings or other incidents. This is still a high-maintenance relationship that requires careful and frequent high level attention to thrive. U.S. Ambassador Nancy Powell is about to retire, and no matter how talented and senior the interim charge d’affaires, the absence of a full-fledged ambassador leaves a gap. This is a time for careful listening to each other’s signals. But the U.S. administration’s top level interest in the India relationship and in Modi needs a public face. President Obama’s publicly acknowledged phone call and invitation to visit does a lot. A very senior U.S. presidential emissary visiting Delhi might be the next step. 1) Modi’s first priority will be to set the economy right with the right emphasis on Agriculture . Gujarat had achieved on an average 9 % growth in Agriculture and if India achieves this figure , Rural India will have totally different picture . In my view, Rural India should contribute 50 % of India’s GDP with 15 % in Agriculture, 15 % on value added farm products and 20 % for services related to the former two . 2 ) India and US will have to understand each other better. There is a big gap in understanding most probably because of cultural impact on comprehension and expressions . US has to take extreme care to avoid actions which could be interpreted as interference in internal matters. In fact , cancellation of Modi’s visa is taken as an inteference into India’s affairs by many Indians including myself . US law makers have no business in the religious freedom in India . I do not exepct a Modi visit to US in the immediate future .This is not a prerequisite for improving ties. 5) Pakistan will be a big issue and Modi will take strong positions . Modi, like many Indians , will not trust US in this matter . Many in India believe that US has been playing a double game for favouring Pakistan . If US is interested to solve this issue , US has to change its approach substantially in a manner acceptable to India . “Expectations are high; meeting them will be an unusually great challenge” : That summarizes the whole situation. There is a lot of space for bravado and grandstanding in Indian Politics. It is the space that the Left failed to occupy in Indian politics that the Right has taken today. It had to happen sooner or later. That it took nearly seven decades for it to happen only reflects the level of tolerance of the people.Ensuring high growth-rate, effectively containing inflation, subsidizing the huge poor segment, bringing about really inclusive development – well if there are magic wands which will work in achieving all these together, who wouldn’t want it. Manipulating and magnifying a steadily grown State, known for its ‘tradesman psyche’ is one thing, but replicating it on a much larger scale, across the hugely diverse country, is another thing. The youth and the poor are not going to be impressed with the ‘shining self-images’, sharply reflected on the high-tech mirrors,of a few. We must wish those who have set out with the ‘wand’ all the very best.